MacGregor DCT Graphite Mens Golf Package Set Deluxe Cart Bag New 2017 Fitted With Graphite Shafted Irons & Graphite Shafted Woods If you want a complete package set that provides an excellent set of clubs and a luxury carry bag, then look no further than this superb package set. 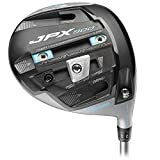 The luxury bag has plenty or storage space and a divider system that holds all of the golf clubs which include a driver, fairway, two hybrids, irons (5-SW) and a putter. Titanium Driver The driver benefits from a high-MOI combined with 10.5 of loft to provide forgiveness and distance off the tee. There is also extra weight placed at the heel and toe areas for enhanced stability. You also get a quick launch off the face, this is thanks to the ultra-thin face design which also improves forgiveness on off-centre hits. The driver comes equipped with a lightweight graphite shaft. Fairway Wood The fairway wood benefits from an oversized head with a low profile that makes it easy to hit off the tea and the turf with a fantastic high launch. This superb package set features: Stainless steel 3-wood and 3 & 4 stainless hybrid Graphite Shafted 5-SW irons, high-MOI putter and Luxury 9inch stand bag PVD plated Titanium driver 12 Month Guarantee & head covers included MacGregor DCT Graphite Irons and Putter These irons offer fantastic forgiveness through the stainless steel cavity featuring heel and toe weighting and an undercut cavity creating a larger sweet spot. All these design features allow for the centre of gravity to be moved lower and further back for all round incredible iron performance. These irons are fitted with Graphite shafts. The putter has been designed with a modern mallet shape which is easy to align for an accurate set up. The face insert offers forgiveness to keep the on your intended line to help you hole more putts. MacGregor DCT Cart Bag This fantastic set comes complete with a luxury cart bag. 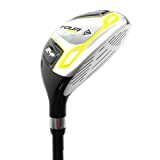 Dunlop Junior Tour Hybrid Ideal for young beginners and those progressing to a more intermediate level, the Dunlop Junior Tour Hybrid has been designed with a flex shaft to lower the speed of the swing and generate more power. This club also features a soft grip handle for comfort and Dunlop branding to complete a professional look. Extra soft feel and added spin control. Available in 4 different colours to match the predator and crystal ranges of clubs, the predator stand bags are small and light to make carrying much easier. They have a 4-way divider, 3 pockets and a full-length clothing pocket, the predator bag is practical but still extremely portable. 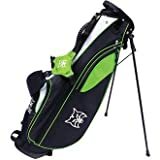 This bag is idea for people playing a lot of golf, who like to carry. ENSURE YOU HAVE MAXIMUM SPIN & CONTROL over the ball. Use the integrated brush to clean your club face & grooves after each shot. NYLON & WIRE BRISTLE OPTIONS available. This is the perfect golf club cleaner & one of the best golf accessories in the world. ONE INTEGRATED UNIT, featuring a high quality golf towel and groove cleaner brush. Taylor made to fit any golf bag or cart for easy access time & time again. GOLF ACCESSORIES DON’T COME MUCH BETTER as this golf towel is super-absorbent & quick-drying, remaining soft to the touch to keep your clubs clean throughout all eighteen holes. QUALITY AND DURABILITY IS A KEY FEATURE OF OUR PRODUCT. These towels are designed to be used round after round. RESULTS SPEAK LOUDER THAN WORDS and with thousands of golfers now using our towels, we must be doing something right! NEW GROOVE RULES EXPLAINED: The revised golf rules significantly increased the spin differential between shots from the fairway & shots from the rough. This was achieved by limiting the groove volume & groove edge sharpness on irons with lofts greater than or equal to 25deg. Professional tours for both men & women like the European Tour, PGA & LPGA have all implemented the new rules in competition. It now effects all amateurs too! WITH THE NEW RULES AFFECTING ALL GOLFER Its more important now than ever to keep your golf club grooves clean to retain that all important spin and control! This is where “Green and Back” golf towels come into their own. No more messing with tee pegs or dirty brushes in your pocket. The solution is a “Green and Back” golf towel hanging off the side of YOUR golf bag. Our golf towels are a highly effective all in one unit with a sturdy non-removable cleaning brush fused into the reinforced base of the towel. Available in both nylon or wire bristle options, they are made from quality materials & designed to be used! It doesn’t matter what brand of golf club you play, our Green & Back golf towels are neutrally branded so will compliment them all. Treat yourself to more GUARANTEED SPIN & CONTROL, or why not treat a friend or a loved one as these make a truly special golf gift. FINALLY A GOLF TOWEL THAT “JUST MAKE SENSE”! DON’T FORGET TO VISIT OUR ONLINE CLOTHING SHOP at greenandback.com Find major golf brands all at honest prices!